Not sure if I have posted this...doesn't matter. I like the view and being that I am in a hurry, going to use it anyway. We will be heading to get Lorelei here shortly for a couple days...so our weekend will be busy. I don't think she knows she is coming yet. Sarah cannot mention it till she is ready to come or Lorelei drives her crazy. Sarah was busy the other day and Lorelei comes in and says, "it's okay...I didn't do anything." So Sarah ask her what did she do....she just says, "it's okay, I didn't do anything." About that time Jeremy comes and asks what Lorelei done...she had been telling him the same thing. So they searched till they found she had got a drawer pull off. But those are words you definitely don't want to hear sometimes...thankfully this wasn't anything bad or messy. We had Puss Puss to the vet this morn for her sneezing...it has never gone away. It would get better at times and almost be completely gone only to start again. She doesn't have a temp, doesn't have a runny nose, or matter in her eyes...but the vet is letting us try antibiotics this time. We got her shots, and her antibiotics and came home poorer by $126--though I guess anyone that can spend that much on a cat could not really qualify as poor. when we go to the vet it is always always more than even this one was. have fun with L, the story reminded me of my Daniel who is now 45, when he was small he would say, i can't have a cookie can I? Aren't vet bills awful? And we love our pets so much and feel we have to spend it. So funny about Lorelei. She needs to learn to keep quiet and not give such loud hints to her mischief :-) Love the photo.....I think I took an almost identical one that day I visited you :-) It is a lovely view and I can see taking it over and over. 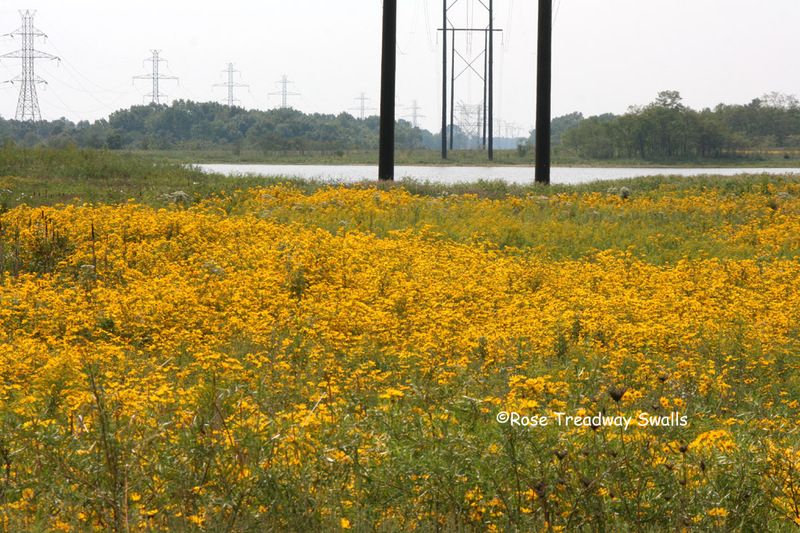 All those gorgeous yellow flowers and the water and even the power lines add to it. she's a cutie that grand daughter of yours, and it's always lovely to hear what she has to say. I have to take Molly for her annual checkup in a couple of weeks time, so I can feel your pain re: vets fees. We don't own any pets, so no vet bills here. Hope they figure out what the trouble is. Love the photo. Hi I'm new to your blog, came through Sandra at Mad Snapper. Sounds like your kitty has an allergy, do hope it sorts out. I hope that the antibiotics make your cat feel better. Love all those golden flowers! I hope Puss Puss is a lot better now. Lorelei is so cute/ I'm so glad that what she DID do wasn't that serious. "It's ok, I didn't do anything," is priceless! Kids are so funny! I love the shot of the yellow field too.